This nail polish has been on my wishlist ever since it was released. 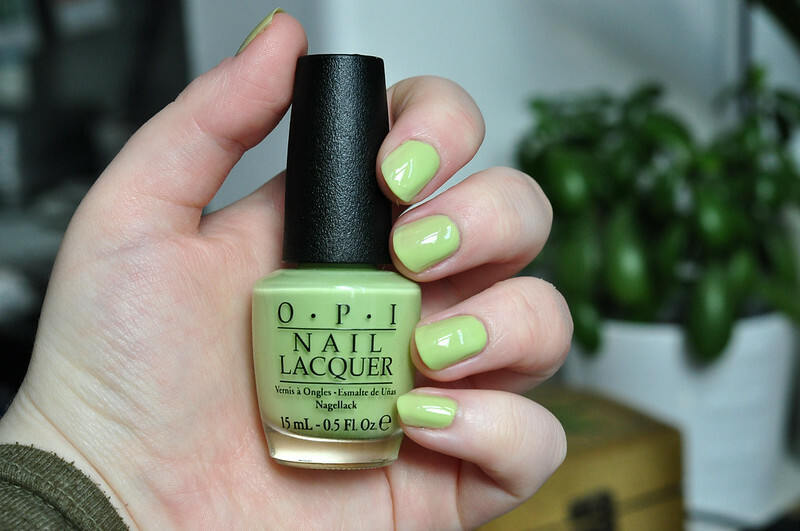 I'm not even sure why I'm drawn to this polish so much but I love the unusual shade of green. It's pastel but not the standard mint green I usually go for. Unfortunately the amount of coats I needed for it to become opaque is what would put me off wearing it on a daily basis. With a base and top coat that's six coats of nail polish in total which is a bit crazy it you think of all the drying time needed in between coats. NYX Pastel Pistachio is a similar colour but with a better formula so I'd probably reach for that more over this one which is a shame. Atomic Orange | Azure For Sure | Blue My Mind | Bright Lights Big Color | Charged Up Cherry | Dazzle Me | Do You Lilac It? | Dominant Jeans | Electric Eel | Fireflies | Flashbulb Fuchsia | Gargantuan Green Grape | Go on Green! | It’s A Bird, It’s A Plane, It’s OPI! | Ladies and Magenta-men | Megawatt?! | Need Sunglasses? | Pink Before You Leap | Purple with a Purpose | Significant Other Color | Sonic Bloom | That’s Berry Daring | Totally Tangerine | Up Front and Personal.